The first public orchard in the city of Santa Cruz has been approved at Riverside Gardens Park in the Lower Ocean Neighborhood. Fruit trees will be planted on February 15th, 2015 in an atmosphere of community celebration. Future harvests – apples, pears, citrus, and more – will be freely available to community gardeners, neighbors, and the general public. The non-profit Santa Cruz Fruit Tree Project, which organizes harvests of surplus fruit as well as events like cider pressing and olive-curing workshops, has organized this project along with Andy Moskowitz, a co-founder of the Grow Quad orchard developed with students on the campus of Harbor High, David Shaw of UCSC’s Common Ground Center, and a contingent of neighbors. The City of Santa Cruz’s Parks and Recreation Department gave the go ahead to plant the orchard this winter. 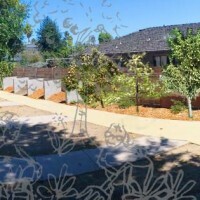 Riverside Gardens Park is the newest park in Santa Cruz, and includes a children’s playground and several community garden allotments. The park is located on a slice of the historic site of the Barson family’s Riverside Hotel, a focal point of the neighborhood for over 100 years. The hotel was especially well known for its extensive surrounding acres of fruit orchards, and the new community orchard will serve as a living link to this history. Similar to dozens of other community “food forests” emerging in cities such as Seattle and Portland, the intention of the orchard is to inspire the community to gather together; to provide itself with a local source of fresh, nutritious food; to put to sustainable use our natural resources of rain, soil, and sunshine; and to spread knowledge of how to bring these techniques to more gardens. Proponents of the project hope its success will help lead to other community orchards in the area, such as along the new rail to trail line, or the Santa Cruz Riverwalk. The public is invited to help plant trees on Sunday, February 15th at 1 o’clock. Donations are being accepted by the Fruit Tree Project to help pay for the fruit trees and soil amendments. Donations can be made to the Santa Cruz Fruit Tree Project at fruitcruz.org/donate, or call 831-435-6719 for more details. Fruit Tree Project on Facebook! Like us on Facebook for more fruit news from Santa Cruz.